That was very true in times past and are words we should try to live by now, both inside and outside our homes. There is so much that is beautiful as well as useful in the plant world. Take for example what my spouse and our Bouvier, Henry, “discovered” on a walk the other day. It was growing in the ditch right alongside the road. We had no idea what it was. It’s not that I hadn’t walked past it a thousand times before. I grew up in this village. Once again it’s a case of “looking” but not actually “seeing.” Thanks to a friend, via a friend (all-knowing florist/lecturer/writer Neville MacKay), we were able to identify it. It’s soapwort. 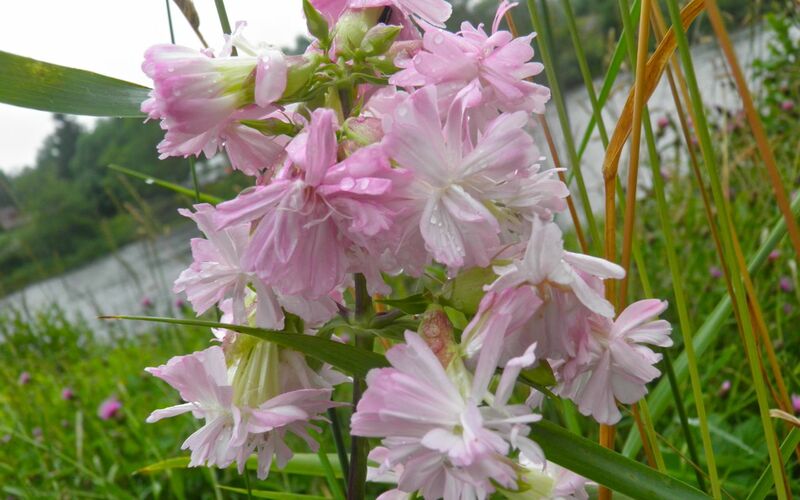 Common Soapwort (Saponaria officinalis) is an old-fashioned perennial plant in the carnation family. Other names for it are Bouncing Bess (or Bet) and soapweed. There are about 20 species of soapworts worldwide. Europeans originally introduced soapwort to North America in colonial times. Bouncing Bess is an old English slang term for a washerwoman. The one growing in the ditch was “Flore Pleno.” Flore-pleno is a more decorative double-flowered soapwort that can grow upwards of 3’ tall on stiff, straight stems. 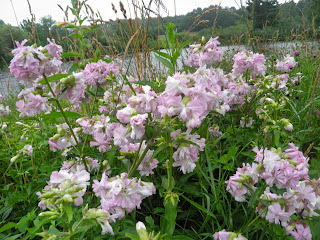 Like the five petalled common soapwort, it is a European native plant now naturalized throughout much of North America. But how did it get into a ditch in a rural village, with no other soapwort around? I believe it was an escapee from a century and a half ago. porch and a mostly glass dining room sticking off to the right. In the heart of the village we have preserved (or pretty much preserved) the home of the first settler, Samuel Hunt and his family. 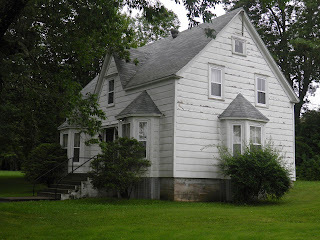 The house went through many additions, at one time being a hotel with dining hall and around 8-10 rentable cabins on the grounds for hunting and fishing enthusiasts. 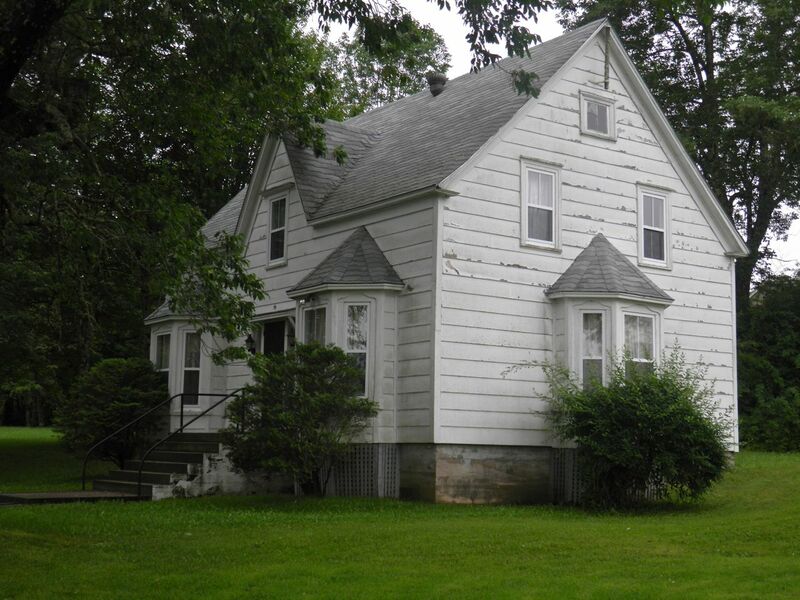 Now it has been torn back to the original structure built around 1830. When it was first erected it would have been one of only a few houses in the village. Since it was imperative to be almost entirely self-sufficient, soapwort was probably brought and planted for its usefulness. The beautiful flowers were a bonus. The botanical name Saponaria is derived from the Latin sapo meaning "soap.” The stems, leaves and roots produce a gentle lather when boiled in water. If you have sensitive skin and find most soaps too drying (and ones you can use too expensive) soapwort may be something to consider. Soapwort contains saponins, which create the soap-like cleaning action. Saponin is also a poison, so is not to be ingested. The roots, when flowering, contain as much as 20% saponin. But it can be used externally in many ways so it a very good garden plant if you like beauty and utility. It is certainly a good choice for the environment. Soapwort soap has no harsh chemicals or environmentally destructive additives and therefore causes no danger when returned to the environment. It’s also very easy to grow. In fact, it does better in poor soil than good. Besides being able to be cultivated from seed, soapwort spreads via a thick rhizome. It can be tenacious. If you dig in your garden parts of the rhizome can end up with other garden refuse and start to grow wherever you dump. Soapwort is cultivated to a certain extent as an ornamental, although nowadays other perennials have nudged this useful garden favourite to the sidelines, or should I say ditches... That’s a shame, as the flowers have a lovely fragrance, which spreads especially well in the evening. Soapwort is an excellent butterfly and moth attractor as well. One caution is to NOT use soapwort-derived soap or shampoo to wash your dog or cat. Because of the saponin, soapwort shouldn't be ingested and a pet might lick some soap residue off if they aren't thoroughly rinsed off. I found this basic recipe for soapwort liquid soap in several places on the web. I haven’t made it... yet. 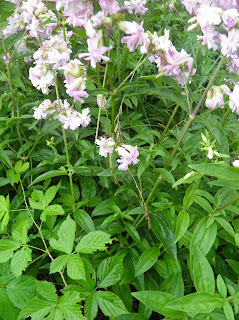 I may wait until next year when we have some soapwort of our own growing in our garden. Brin the water to a boil. Add the soapwort and cover the pan. Simmer for 15 minutes, then remove from the heat and let cool. Strain through several layers of cheesecloth. If using additives, stir in once cool. Whisk the mixture, bottle and refrigerate. It will keep for about 1 week. Thanks, belatedly, for this post. I am very fond of this weed and so was my mother, who was called Betty. It is a very nostalgic plant. Blessings on those who have it. For it only seems to grow where it listeth.